Borg Hendrickson from Idaho believes my claims of over 99 percent adult salmon survival and over 95 percent juvenile survival past each lower Snake River dam are false and misleading. University of Idaho researchers, contracted by the U.S. Army Corps of Engineers, radio-tracked adult spring Chinook from Ice Harbor Dam to their spawning areas up to 100 miles beyond Lewiston. Average survival was over 99 percent. Claiming 99 percent survival of adults past each dam is therefore very conservative. Project survival includes survival past each dam and through its reservoir. I said juvenile salmon survival past each dam is over 95 percent. I did not discuss reservoir survival. Borg says NOAA Fisheries estimated a 10-year average of 59 percent survival from Lower Granite Dam to below Bonneville Dam. Borg's parsing 59 percent to per project survival yields 93.6 percent which, given some reservoir mortality, supports the 95 percent per dam survival. Achieving high dam survival has taken a long time and investment of hundreds of millions of dollars for research and structural improvements by the Corps. Borg discussed smolt-to-adult return rates (SARs) SARs are the number of passive integrated transponder tagged adults detected at a point divided by the number of tagged smolts detected passing that point one to four years earlier. Lower Granite Dam is where most Snake River salmon SARs are measured. Transporting juvenile salmon from Lower Granite to below Bonneville Dam consistently gives over 98 percent smolt survival. Based on SARs for tagged juveniles transported from Lower Granite divided into the resulting number of known tagged adults that return to Lower Granite, transport SARs usually exceed in-river SARs. In-river SARs are roughly estimated because most juvenile salmon are not tagged. NOAA Fisheries estimates how many smolts pass Lower Granite Dam in-river then divides that number into the number of returning adults from smolts that were not transported. Historically (aka. long ago) over harvest in the river and ocean and habitat loss by agriculture, logging, or by dams like Lewiston Dam, Sunbeam Dam, the Hells Canyon, Oxbow, Brownlee complex, and other private dams in Idaho drove ESA listing. Predation by thousands of outgoing juveniles by birds, and incoming adults by seals and sea lions in the lower Columbia greatly reduce the numbers of returning adults. 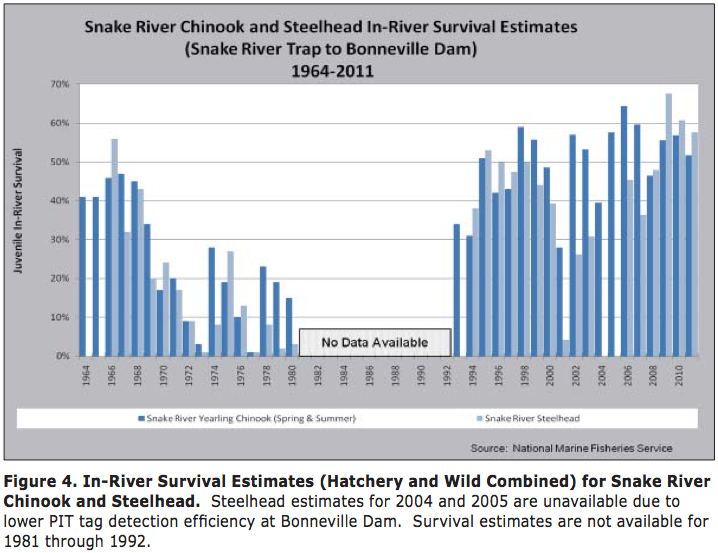 Improved smolt survival is being offset by poor lower river and ocean survival, and though SARs remain low, higher adult returns are coming again in 2015.